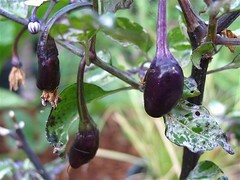 I noticed that the Tri-Color Variegata Peppers has fruits. Yeay! I planted the “forgotten” Lettuce and Swiss Chard grown from seed to the edge of the vegetable bed near the Cucumbers. I also planted a “forgotten” Brandywine OTV Tomato in an empty space in the other bed. I really doubt if it will produce fruits, but I felt bad for not planting it sooner. I transplanted the “forgotten” Perillas–Large Leaf Korean Perilla ( photo ) and Tia To Vietnamese Perilla ( photo )–into larger pots, so they can grow a little larger before I plant them either in the vegetable bed, or in a Coleus pot. This evening, I cooked a simple Filipino dish called Adobong Kangkong for dinner. As I was preparing the Kangkong (Water Spinach), I decided to save some to see if it would root. I did some research and was surprised to discovered that Kangkong is a member of the Ipomoea genus along with Morning Glories and Sweet Potatoes. With the success of directly planting the Tendergreen Bush Beans, I decided to try planting Kentucky Wonder Pole Beans on a trellis which had Snap Peas. I think it may be a little late, but I’ll see how these turn out. Along with some New Zealand Spinach that my mom harvested, I harvested my first peppers (1 Hungarian Hot Wax Pepper and 2 Pepperoncini) and some White Icicle Radishes for a Filipino dish called Sinagang that my mom will make for dinner. I also planted the 4 Coleuses that I purchased on Saturday in a large terra cotta pot. 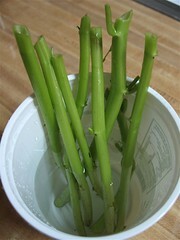 I took cuttings of the taller ones and place them in water to root. The Sunflower seeds I planted on Tuesday have sprouted and are about an inch tall.